Recently got turned onto an article which very eloquently explains why modern art, and it’s basis in nihilism and relativism is well and truly terrible. Not just as ‘art’ but as a bellweather for decline in society. Succinctly, ‘truth’ is an objective thing, despite all the overly-wordy ‘art-speak’ denigrating the work of actual masters. ‘Abstract art’ is neither abstract (e.g. a blueprint is an abstract of a building, while random splotches of paint on canvas are not a recognizable distillation of anything), nor art, and especially not fine art. Go there, and read the whole thing. I’ve thought this for years, but have never been able to put into such succinct verbiage the ‘gut feeling’ which is in complete agreement with the folks over at the Art Renewal Center where this article is hosted. Fine art photography follows the template they espouse, since it is the promotion of a universal language, expressing the feelings and highlighting the subject of the artist. It also requires the development of skill with the tools of the trade, and while development of that skill is initially easier than with pencil, pen, paint, and paper, that skill still matters. 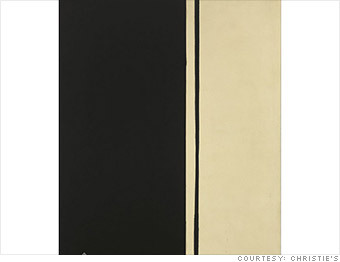 NB: The ‘art’ shown as the featured image is “Black Fire I”, which sold for $84M. It’s likely worth ~$84.00, and that’s just for the canvas and wood it’s made of.